The ESM50 is the most powerful cuttingtool in the Next Generation Mini Series. 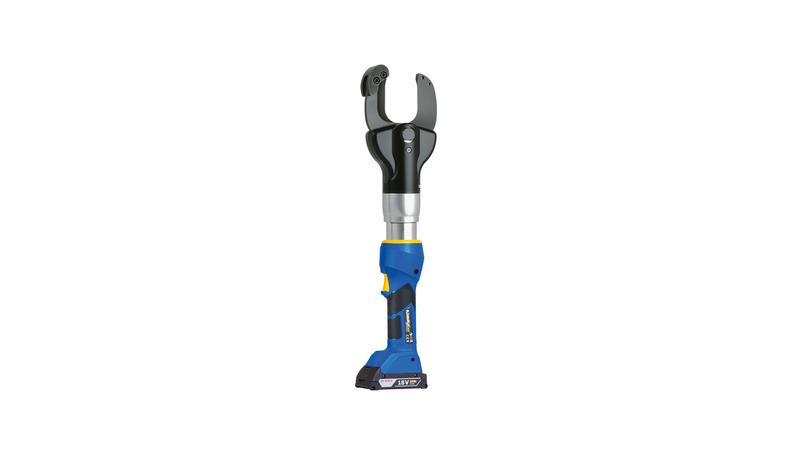 The open and rotatable cutting head is particularly suitable for severing copper and aluminium cable up to a diameter of 50 mm. Both multi-strand as well as fine-stranded cable (even armoured) can be dependably cut. In this way you only need one tool for a number of applications. Thanks to its new cutting geometry, the bothersome catching of wire in the cutting edges has also become a thing of the past. A particular highlight is provided by the innovative opening mechanism, a system that enables safer and faster work. Just in case an unwanted object gets caught up between the cutting edges, the operating button simply needs to be released. The two cutting edges then separate from one another immediately. Additionally, thanks to this mechanism, the tool is ready to make the next cut directly after performing the previous one. Additionally, the battery platform can be selected individually: each tool can be ordered either in the Bosch or Makita version.